Over the last several years, Azima DLI’s integrated monitoring and diagnostics solution has been applied extensively at Nucor Steel’s Hickman Sheet Mill. Automated data collection has been introduced and applied in concert with established traditional manual condition monitoring programs at the mill. Data collected from both methods is interpreted and displayed via a single Web portal and diagnostics are performed remotely by Azima analysts. This article describes the justification, development, application and benefits of such an integrated solution. Specific case studies will be presented along with discussions of deployment issues and barriers that have been overcome. Condition monitoring, commonly referred to as predictive maintenance, is a proven approach to improving reliability and productivity in industry. 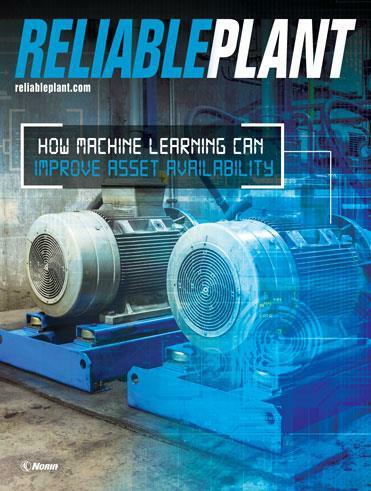 Its underlying philosophy is that technology can be used to measure and evaluate the condition of plant assets and equipment, thus enabling intelligent decisions to be made about maintenance activity. In this manner, maintenance is applied to the assets that need attention, while those whose performance and condition are determined to be normal are left alone to perform productive roles. The initial application of condition monitoring was in the utility and petrochemical industries in the 1970s. During this period, tremendous plant expansions and constructions were taking place, and plant scale increased dramatically. Instead of being dependent on many small machines, plant train size and capacity were such that a typical refinery or large generating plant became absolutely dependent on a very few, very large and very expensive capital machines. The loss of one of these capital assets (primarily rotating machinery) to mechanical failure could (and did) result in major income losses and, in the case of some the larger petrochemical plants, actual disruptions in markets. This reality resulted in the development of fault protection systems (warning/trip systems based on vibration analysis) for protecting rotating capital machinery from catastrophic failure. These fault protection systems proved very successful in preventing crashes and limiting the damage from machine failure. These systems were soon institutionalized and standards (API, etc.) were developed and accepted throughout the appropriate industries. Due to the success of fault protection systems, many plant operators began to suspect that similar approaches could be applied to the myriad of smaller machines in the plant. Even though the failure of one of these smaller machines could not itself shut down a plant, the aggregate cost of repairs on these machines made the application of condition monitoring an attractive prospect in a typical refinery or chemical plant. However, the high per-machine cost of applying a fault protection system prohibited this from becoming a reality. Instead, technology responded with the development of portable measurement instruments. Beginning with simple meters, manual log sheets and trending, machine surveillance programs were born. Beginning in the late 1980s, the explosion of PC/computer technology drove the development of computerized manual data collection systems which rapidly gained success in the plant maintenance market. In very short order, the use of “data collector” systems – programmable black boxes with well-defined measurement capabilities – spread to many industries, including the steel industry. A “route” defining the machines to be measured and the specific measurements to be taken was created in PC-based software and downloaded to the data collector. Personnel would go out into the plant to collect data with the device and then upload the data. This data would then be analyzed and a report was issued recommending appropriate maintenance actions. Through the tremendous advances in data processing technology, these so-called “walk-around systems” have progressed to the point where the limit is no longer measurement technology. Megabytes of machine condition data can be gathered in a day, with relatively low skill requirements. This approach represents the status quo to this day. Current data collector systems are very powerful and represent near-miraculous improvements over the initial 1980s systems. Modern data collectors are intended primarily to collect rotating machinery vibration data (although other scalar and non-dynamic data, including manual observations and comments can typically be entered). The accompanying software enables the presentation of the collected data for analysis. This software typically supports the incorporation of other external data, such as infrared thermography and lubricant analysis. In a typical EAF/mini-mill environment, the actual execution and responsibility for such a walk-around vibration program resides either in-house or with outside contract resources. A typical AF/mini-mill with an associated cold mill may have 500 to 600 individual machines under monitoring/surveillance via data collector/walk-around methods, with somewhere between 5,000 and 10,000 individual measurements being taken each month. This represents, under typical conditions, about one to two man-weeks of measurement effort alone. Data analysis typically consumes another man-week. Today’s manual data collector systems have reached a near-zenith in efficiency. Early on (late 1980s), processing technology in microprocessors and memory limited their performance and, depending on the measurements to be taken, the technician analyst was often waiting for the data collector to do a given task. As such, his efficiency was limited. Processing technology today has advanced to the point where the required sample times and the fundamental mathematics of data digitization are the time limit, rather than the performance of hardware and software. It is not reasonable to expect any significant gains in terms of data collection time due to measurement technology changes. In a manual data collection program, achieving a load factor (time spent actually taking measurements as opposed to traveling from point to point, uploading and downloading data, etc.) of 60 to 70 percent is a significant achievement. It is not unusual for the data collection portion of a condition monitoring to consume 70 percent or more of recurring operating/labor costs. Data collection is, of course, only part of the process of executing a successful condition monitoring program. Data analysis, screening processes and reporting are essential to achieving cost reductions and improvements in uptime. In most cases, the availability and skill of personnel with the proper experience and training are the governing factors in the success of a condition monitoring program. Collecting data is not hard; making the appropriate use of the data is much more difficult to achieve consistently. Despite very capable measurement technology, condition monitoring success in a given plant is still dependent on the ability to gather and correctly interpret data from the plant machinery. Manual data collection processes, even in the presence of efficient data collection and skilled analysis, are still snapshot in nature and may not reflect the actual operating conditions that plant equipment experience. This is because there are more day-to-day variations in data than is revealed by a monthly collection route. Historically, the steel industry has been willing to adopt condition monitoring as a means of improving mill productivity, and many successful programs are extant in mills. Whether contracted out or executed in-house, the same issues governing successful implementation of a condition monitoring program exist. The most difficult issue is retention of the appropriate skills and experience in the condition monitoring role. Be very conversant with rotating machinery and machine components – the individual has to understand couplings, bearings and gears, machine dynamics (at least at some basic level), and the factors that affect machine wear and tear. Be at least conversant with (or be able and willing to be trained in) more esoteric concepts like spectrum analysis, frequency analysis, phase, modulation, etc., and have sufficient understanding of some basic concepts that normally are not part of the vocabulary of an individual with the requisite mechanical skills. Be competent with computer technology, at least to the level of an advanced application user – all of the current condition monitoring technologies involve computer usage to a very large degree. Be a skilled communicator. Clearly explaining the reasoning behind a given recommendation is a key and often overlooked requirement for a successful condition monitoring program. Be willing (or have personnel that are willing) to routinely do hot, dirty, repetitive data collection work, that typically involves difficult-to-access or hazardous areas. It is not hard to understand why maintaining the appropriate people resources, whether in-house or contracted out, is difficult to achieve over the long haul. In the developing years of condition monitoring technology (late 1970s to early 1990s), most plants, regardless of size, had one or two (sometimes many more) resources devoted to condition monitoring programs. This supply led to an effective “farm club” system that supplied experienced personnel to both the in-the-plant programs and outside contract/consultant sources. Changes in plant manning, personnel and position rotations, and retirements have resulted in a situation where the availability of such personnel is limited and shrinking, and the cost of those workers is rising. The decline in the availability of human resources with the appropriate experience and skill sets has led to the exploration of ways to bring the data to the analyst. In this manner, a person with the requisite skills can cover far more industrial real estate than would otherwise be possible. Since the late 1970s, adoption of automation for plant and process control and communication has risen substantially both in complexity and market acceptance. Computers on every desk and in every control room are now the norm. Mills and plants typically have very sophisticated and extensive IT networks for both administrative and process control/automation. First approaches in many diverse industries involved transmission of machine-condition-related data to existing Man-Machine Interface (MMI)/Human-Machine Interface (HMI) systems. Particularly, existing machinery protection (warning and trip) systems were tied into control room HMI/MMI interfaces so that operators could view vibration, temperature and other machine condition parameters. Typically, these were magnitude-only scalar values, which – while valuable in terms of information and indication of possible machine problems – were lacking in terms of trending, analysis and data interpretation capabilities. Plant personnel were thus receiving information that a given machine was vibrating more, or a bearing temperature was going up, etc. This left open the question of why these changes were occurring, and how the plant should react to these changes. Advances in technology, the Internet and the need to more efficiently monitor machinery with limited personnel drove the development of expanded remote monitoring systems. Rather than delivering machine data in-house only (to the control room, etc. ), technology and the Internet enable information to be accessed from anywhere, anytime. This new method uses field-mounted sensing devices and instruments, some sort of aggregating devices, advanced software, and access to plant and external networks for data transmission. More frequent monitoring of machinery without a need for data collection/analysis personnel to be present, as well as the ability to observe dynamic changes in machine condition due to load, speed and operating conditions. The ability to move data off-site for remote consultation. The ability to have multiple resources in multiple locations looking at data. The ability to monitor parameters other than what would normally be monitored in a traditional manual program. The ability to assess machine performance in terms of efficiency, throughput, etc., and relate that data to machine condition. Nucor Hickman has had a condition monitoring program in place for more than 10 years. The program was based around traditional manual survey methodology and techniques, and was provided by outside contract resources. Data was collected on equipment across the mill on a monthly basis, with frequent callouts for troubleshooting and analysis of specific problems. After data collection, analysis was performed and written reports with recommendations were disseminated to appropriate mill personnel. All systems in the mill (environmental, hot mill, casters and melt shop) were included. In 1998, Nucor Hickman added a cold mill facility, with pickling line, galvanizing line, RT mill and annealing capability. The traditional monitoring program was expanded (nearly doubled) to include this portion of the mill. After the integration of the cold mill into the program, 590 machines were under monthly surveillance. A typical survey required two to three man-weeks to complete by manual methods. As early forms of remote data collection and analysis methods became available, opportunities rose where remote monitoring might be practical and beneficial. In the first case, caster mold water cooling pumps, which had traditionally been a maintenance problem, became a potential application due to changes in operating conditions. The mold water pump installation at Nucor Hickman at that point consisted of three 700-horsepower opposed suction centrifugal pumps, direct coupled to induction motor drivers. In typical operations, two pumps were in service and one maintained as in inline spare. Operational requirements dictated a need for increased mold water flow, and all three pumps were placed in service. This had a negative impact in terms of pump vibration levels and reduced confidence in pump reliability. There was no remaining spare capacity (the standby pump was now in continuous service), making the impact of a pump failure significant. Nucor Hickman decided to apply some of the early remote, Internet-based monitoring technologies to the pumps. Expected benefits were closer-to-real-time problem detection and better understanding of the pumps’ vibration behavior. In addition, a current sensor was added to the systems on each motor, which would allow monitoring of system load in parallel with pump and motor vibration on each of the pumps. The system would report bearing temperatures, vibration magnitudes, discharge pressures, current magnitudes and frequency content/time domain vibration data from each pump. This data was available to contractor analysis personnel, who were responsible for monitoring the pumps’ behavior, and also to plant personnel. In addition, the data was available over the Web, making it accessible from anywhere with an Internet connection. Multiple users could access the system at the same time from multiple locations. The Internet-based monitoring system was installed with data being collected much more frequently and under different operational conditions. Within days of commissioning the online remote system, it was obvious that the vibration behavior of the pumps varied much more widely than had been indicated by the once-per-month data. This is because monthly data – even several years worth of it – was simply insufficient to notice it. The frequent collection enabled by the automated system clearly showed 3:1 variations over different operational modes. In addition, load current data (which was not available from the traditional once/month data) indicated that the pumps were typically not loaded nearly to capacity, and were operating well off curve. As a result, an engineering study of the pump systems and operation was commissioned. The study concluded that sizing errors, control strategies and piping configurations were incorrect for the desired operating conditions. The pumps were resized and other changes were put in place to provide the desired increased flow. This provided spare capacity without the need to run all three pumps, and contributed materially to improved cooling and mold life. It is highly unlikely that these issues would have come to light without the data provided by the remote monitoring system. Further applications of remote monitoring technology were installed on baghouse ID fans and utility air compressors in the hot mill. The hot mill air compressors are three-stage centrifugal machines, directly driven by two-pole induction motors. The compressors and motors were on monthly surveillance and were subject to frequent bearing failures in the drive motors. Once-per-month data was catching bearing failures often, but trends were erratic and no clear root cause was detected. When remote monitoring technology was applied, it became clear that – as with the mold water pumps – the vibration levels were varying much more than had been apparent from the monthly manual data. It was also clear that the variations had a pattern that closely tracked ambient temperatures. Since bearing temperatures also were being monitored, it was clear that when ambient temperature went up, vibration levels increased dramatically. Analysis of the frequency content provided by the remote monitoring system clearly indicated that the cause of the increase in vibration was imbalance in the motor rotors. Further review of bearing wear patterns indicated an extreme thrust load was being placed on the motor’s radial Conrad-type ball bearings. From this, it became apparent that at high temperatures the motor rotor was expanding axially and there was insufficient clearance in the motor bearing fits to allow for this expansion, causing rotor bow (hence the imbalance) and axial overload of the motor bearings. As a result of this discovery, the compressor drive motors were replaced with an alternate design. Vibration levels, as reported by the remote monitoring system, remained low and reliability dramatically improved. In the cold mill at Hickman, the RT mill stand drives were equipped with four 5,000 HP synchronous motors. The motors were journal bearing machines and were not reliable. Thrusting and resultant bearing failures, along with pole piece electrical failures, led to the 2004 installation of a warning and trip system based on proximity probes on the motors and accelerometers on the mill gearboxes. This system not only supplied warning and trip capability, but also provided near real-time vibration data, including shaft orbits, to analysis personnel outside the mill. Remote analysis personnel could be hundreds of miles away, viewing near-real-time data, and consulting directly with pulpit operators on problems with the mill stands. As a result of these and other successes, it was clear that remote machinery monitoring offered improvements and capabilities not provided by conventional means. However, this early system did have limitations. It relied on serial RS-485 communications with a scanner/site server. As the system expanded, sampling rates slowed down and the most recent data was not available in a timely fashion. It also used proprietary sensors, which limited configurability and flexibility of application. The system on the RT mill, while powerful, was expensive and was limited to one user at a time due to its use of VPN technology. Beginning in late 2004 and early 2005, Nucor Hickman undertook deployment of wireless technology in the mill. The justification was shipping and inventory applications, cranes and systems in the hot mill, and to meet other operational requirements. At the same time, improved remote monitoring technology was coming on the market using the same wireless protocols. This new remote monitoring technology, developed by Azima DLI, used commercial-off-the-shelf (COTS) sensors, standard networking protocols, and was much more flexible in terms of software and application. The convergence of wireless technology, its application in the mill, and the availability of improved technology all drove expansion of Nucor Hickman’s remote equipment monitoring. It is interesting to note that the wireless implementation and deployment was justified by other applications within the mill. The impact of the machinery monitoring data on the network has been minimal, and even with the extensive deployment at Nucor Hickman, represents a tiny fraction of network traffic. 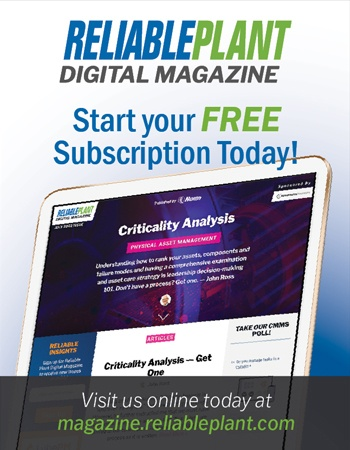 Nucor Hickman: Largest Remote Monitoring Deployment in the U.S.
As of the publication of this article, the Nucor Hickman Sheet Mill was the site of the largest dynamic signal remote monitoring deployment in the United States. 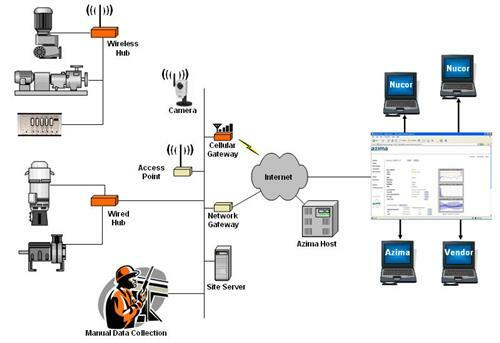 Azima remote monitoring technology is used on all mill cooling towers, all baghouse ID fans, all baghouse reverse air fans, caster mold water pumps, caster spray water pumps, all descale pumps, roof feed flux system aspiration fans, and mill air compressors. Remote monitoring system installation is underway on mill emergency generator sets, and is planned for the near future shape tension rolls in the cold mill. Approximately 280 sensors are remotely monitored. Mill personnel have full access to data, alert histories, alarms and warnings, reports and report/machine histories. Alerts are transmitted by e-mail and/or cell phone SMS text message. The system currently applied at Nucor Hickman communicates through the plant network either via 802.11b wireless technology or via standard Ethernet (unlike earlier systems, which required serial RS-485 communication). A single small site server (standard PC) is located at the plant to act as a data gateway and buffering device. If connectivity out of the mill is lost, the site server acts as a data storage device buffering data until connectivity is restored. One of the key features is that the monitoring application requires no software on the target client PC – all that is required is Internet access and a login for the system. Data is sent via the plant network to the local site server and then out over the Internet to Azima DLI’s remote servers. Plant personnel, analysts or other authorized parties can then access the system via a secure Web portal. Access and privileges are controlled by double password, and depending on privileges, a user can have rights to view data, edit system settings, analyze data and/or issue reports. All data, alerts and alert histories, and reports generated by analysts are maintained on the Web portal. Histories of reports generated can be sorted and searched by plant area, date, machine, fault type and other criteria. While the number of remotely monitored machines continues to expand at Nucor Hickman, many less critical machines remain under manual surveillance by operators on rounds once a month. These machines include those in the balance of plant (hydraulic pumps, roll stand cooling pumps, furnace cooling pumps, and so forth). This monthly data is fed into the Azima DLI system and displayed via the same secure Web interface as the remotely collected data. This means that a mill-wide view of equipment health – from all monitored machines, regardless of collection method – is visible via a single platform. Azima analysts are responsible for monitoring and analyzing all posted to the Web interface. Careful thought should be given as to which machines are to be monitored and in what manner. In the case of Hickman, although the condition monitoring contractor had overall responsibility for the implementation and operation of the system, and for disseminating the analysis and results there from, each individual mill area had to decide what was to be monitored and how. Reporting relationships, access and other issues were all discussed and defined well ahead of the installation of monitoring equipment. There was a clear list of which equipment would benefit from automated remote monitoring and which could be sufficiently monitored by conventional methods. Number of points per machine to be monitored is an important consideration. Simply mimicking what would have been done in a manual monitoring program (multiple points and measurements per bearing) is usually unnecessary and adds cost while delivering small incremental value. If wireless transmission is to be employed, determine the best protocol for the site: 802.11b/g, ZigBee, or 900 megahertz. In the case of Hickman, 802.11b was the preferred choice and that has been universally true in other applications as well. It offers the widest selection of available devices, and can cover a wide area with just a few access points. The 802.11b protocol has proven to be very reliable and is immune to RF interference, even in the melt shop area. Involve IT early. Agreement needs to be reached on security, protocols, etc. well before the installation of a remote monitoring system. What are the mill’s security expectations and policies? Within the plant, is traditional Local Area Network (LAN) acceptable, or is a Virtual Local Area Network (VLAN) necessary? IT support during deployment is crucial to successful and efficient startup. Connectivity must be verified, etc. The initial deployment of the current generation of remote machinery monitoring technology commenced in July 2005. The installation and commissioning of Azima’s remote monitoring system is continuing to expand. The hybrid approach of monitoring critical machines in parallel with traditional manual walk-around monitoring of balance-of-plant equipment, all reported via a common Web-based portal, has provided solid value to Nucor Hickman personnel. Several case studies demonstrating this value are briefly detailed below. In the spring of 2006, a 1,500 HP baghouse fan induction motor failed due to a sudden stator short failure. All of the baghouse fans were equipped with remote monitoring hubs and were under surveillance. The motor was replaced with a rebuilt spare. Immediately on restart of the fan, much higher vibration levels were noted by the remote monitoring analyst (who was not on site). Mill environmental department personnel, who were responsible for the baghouse and its equipment, were notified of the increased vibration. Further examination of the data identified the problem as an outer race defect on the inboard (drive end) bearing of the motor. Mill personnel requested an evaluation as to the likelihood of the motor continuing in service until the next maintenance outage. Analysis of the data and the rate of change indicated that it was likely that the unit would indeed continue to run. In an attempt to increase the likelihood of a successful outcome, attempts at relubrication of the motor bearing were undertaken. Unfortunately, the relubrication actually increased the vibration, and the rate of deterioration increased dramatically. Mill personnel were advised of the change, and monitoring surveillance increased (frequency of data collection can be increased remotely via the Azima system’s interface). The unit continued to deteriorate and, by the weekend, had reached a stage wherein continued operation was questionable. A recommendation was made to remove the unit from service at the first opportunity. After mutual viewing of the data and trends by plant personnel in conference with the remote analyst, plant personnel decided to remove the unit from service. A spare fan was placed in service while the motor replacement was undertaken. The spare fan also was equipped with sensors that reported to the Azima system. Prior to beginning disassembly of the failed fan, the spare was restarted and vibration and performance data was reviewed by the remote analyst, who confirmed that the spare fan was running well and could be expected to give reliable service while the failed fan was repaired. Only after the confirmation of the health of the spare was the failed fan removed from service. It should be noted that at no time during this episode was the equipment analyst on site at the mill. Problem detection, confirmation of the problem and diagnostics (including the condition assessment of the spare fan) were all conducted remotely with no site visits and no costs incurred. In the case of the confirmation of the condition of the spare fan, the contractor analyst was in an airport hundreds of miles away and was still able to serve the mill. It is unlikely that this level of detection, service and continued operation could have been achieved with conventional once/month survey method. Using conventional methods, it is likely that several site visits would have been required with extra costs incurred. A centrifugal induction motor-driven air compressor had suffered from poor reliability for some time. Beginning in the spring of 2006, it was equipped with remote monitoring technology. Immediately upon installation of the system, dramatic variations in motor vibration level with compressor load were noted. Remotely acquired and analyzed vibration data indicated that bearing fits were in poor condition, and that the spacer gear coupling associated with this compressor was partially locked up. A recommendation was made to not yet remove the unit from service, but rather to continue to run and monitor it while preparations for a repair were made. Data also was provided to the motor repair vendor. The motor repair vendor concurred that the vibration data indicated a problem but that it was likely confined to the coupling. The recommendation was made by the motor repair vendor to disconnect the coupling, run the motor solo, and take manual measurements to confirm the coupling problem. The coupling was disconnected, the motor was run solo and manual vibration measurements were undertaken. The motor was actually worse in the uncoupled condition, and before the vibration measurements could be completed, the motor failed catastrophically. When the motor repair was completed and the unit returned to service, the remote monitoring system was recommissioned and was able to confirm that the motor and compressor were in good condition and suitable for continued service. This condition persisted for several months, with the unit running well and remote monitoring continuing. Unfortunately, following a mill outage, the compressor motor vibration exhibited a small but unmistakable increase in overall vibration on the motor. The melt shop personnel were notified and the recommendation was made to continue to run the compressor. Monitoring frequency was increased and alert thresholds adjusted to compensate for the changes. No site visits were required and the increased monitoring and adjustments were accomplished remotely via the system’s interface. A few weeks later, the adjusted alert levels were exceeded, and automated alerts were issued. No other changes were made. Within a few more weeks, the steady trend upward in motor vibration continued. Plant personnel were continuously advised as to the deteriorating condition of the unit, as was the motor repair vendor. Finally, the deterioration reached a level where the remote analyst recommended removing the unit from service at the convenient opportunity. The motor repair vendor sent personnel to the site to take manual vibration measurements on the motor. The manual measurements confirmed the problem and the unit was removed from service and sent out for repair. A coupling issue and deterioration of the inboard motor bearing was confirmed. Again, no site visits by analysis personnel were required and the plant was able to “run the unit the last mile” without incurring catastrophic failure or mill outages. A remote monitoring system can, as in the cases above, greatly expand on the capabilities of conventional rotating machinery vibration analysis. What many do not realize is that remote monitoring technology can also contribute in ways that are not possible with conventional manual monitoring. The baghouse fans at NUCOR Hickman are vital to the plant. Maintenance of plant productivity, while still staying within permitted emission limits, is essential to plant profitability. Operating costs (in terms of power consumption) for several thousand horsepower of fan drives is significant. The monitoring system, as applied to the baghouse fans at Hickman, incorporates vibration measurements along with load current measurements. Sampling rates are very rapid, and the baghouse fans at Hickman have an essentially unity power factor. The fan motors are not individually metered at the MCCs. With the rapid sampling of the remote monitoring system, however, it became possible to get a reasonably accurate measure of fan load and operating cost. 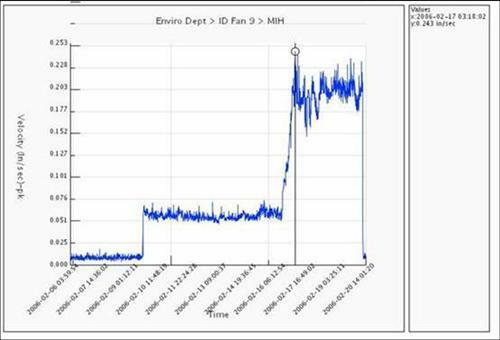 Soon after commissioning the baghouse fan remote monitoring system, is was seen that variations in fan load and fan vibration were, not surprisingly, directly related to tap-to-tap cycles of the EAFs. All of the fans take suction from a common plenum, which is in turn fed by the furnace and canopy ducts. 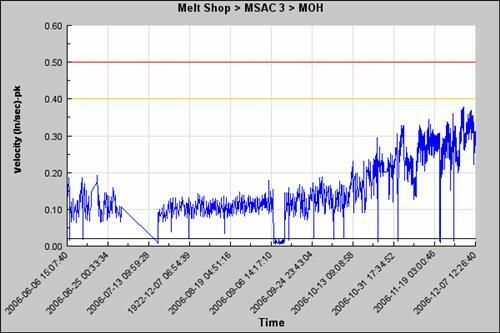 Data collected by the remote monitoring system allowed observation of the dynamics of fan load as the melt shop underwent normal operation cycles. The ability to average and integrate the load data unexpectedly revealed that significant variation in fan HP load existed not only during furnace cycles but from one fan to another. The data indicated a several-thousand-dollars-per-month variation in the operating cost of the fans. After data review, it became apparent that there was significant temperature (and thus density and mass flow) variation from one fan to the next. The variation in load was confirmed by temperature measurements and infrared thermographic observation of the change in duct temperatures over time. Poor distribution in the plenum has been partially corrected by installing turning vanes in the plenum and adjusting damper control strategy. Material improvements in fan efficiency have been realized as a result of these actions. The remote monitoring system allowed quantification of these issues and the ability to directly measure the effects of corrective action. This would not have been possible with conventional machinery monitoring techniques. Nucor Hickman is embracing new remote monitoring technologies and integrating them with its existing manual data collection process. By determining the most effective monitoring method for each machine – based on level of criticality, history of problems, and so forth – Nucor has established a comprehensive monitoring program that delivers increased uptime, reduced safety risks, and lower maintenance costs. By choosing the Azima DLI monitoring and diagnostics system, Nucor has installed a flexible system that supports the integration of data collected both by automated system and manual rounds. All data is presented via a single, secure Web interface. This enables mill-wide alerts to potential problems and delivers critical data to remotely located Azima analysts for review, analysis and advice. In addition to providing more comprehensive monitoring, Azima’s remote monitoring solution has reduced the demand on existing resources at Nucor Hickman and frees them up to focus on maintenance rather than data collection. The program has been successful to date at Hickman, with clear successes and benefits, and further expansion is expected. As with most technological pursuits the real reason for success is people. We wish to offer sincerest thanks to the team at Nucor Hickman. The manager of the environmental department, Wayne Turney, and the department supervisor, Dan Bullock, have been particularly instrumental in the ongoing implementation. Dave DaVolt, Rod Wycoff, Claude Riggin, Justin Smith, Ashley Tippet, Tom Wright and Lou Incrocci in the hot mill, cold mill and melt shop have all contributed to the successful demonstration of these technologies. Likewise, success would have been impossible without the support, expert advice and consultation from the Nucor Hickman IT group. Rudy Moser, department manager, and Jim Walmsley, network support, were essential in making the implementation a success. On the part of Azima DLI, Dr. Ed Futcher and his development team created the tools to make the systems possible, and Heather De Jesús and Dave Geswein, Azima engineering, deployed the system at the mill. Nelson A. Baxter, vice president of diagnostics for Azima, was invaluable in technical support and expertise. Elsa Anzalone, account manager for Azima, made the case for what has been achieved in this project, and her contributions have been invaluable. For more information on these and other condition monitoring technologies, visit the Azima DLI Web site at www.azimadli.com.